Willa Nolte, the founder and owner of Kanna Industries, grew up on a farm in the Karoo he therefore knows first hand that every farm and each situation is unique.For this reason we design and build purpose driven farm equipment that will satisfy our clients’ specific needs. The Kanna Bale Grabber was designed due to the fact that our clients needed something that could help them stack their round bales. If your bales need to be packed underneath a roof and your space is limited then our bale grabber will come in very handy as it can grab bales in a standing as well as a lying position. It can lift the bales and stack up to 3 bales on top of each other. The grabber is designed to easily fit onto your existing loader. Our bale loader is a trailer that loads round bales, by it self, directly from the field and offloads it were needed. It can handle 6-9 bales at a time and is managed hydraulically by the tractor’s driver. Our Bigpack Bale Loader gets pulled behind a tractor. Once you are ready to load the bales the drawbar of the loader gets shifted by means of a hydrolysed cylinder until the loader is positioned on the right back side of the tractor. The grab press moves very low on the ground and then grabs the bale so that the long side of the bale points to the front. It then lifts the bale up and the bale the glides down to the bed of the loader. The process is repeated until 6 bales are loaded. The bed of the loader can tip to offload the 6 bales on top of each other. Our Cotton Bale Loader can load a cotton bale with a mass of 2-3 tons. The Loader can be pulled behind a tractor of 100kW. Due to the mass of the cotton bales uploading happens while the tractor and loader is standing still. The load fork of the cotton bale loader descends to the ground and then the bale is scooped up on the right side of the loader. 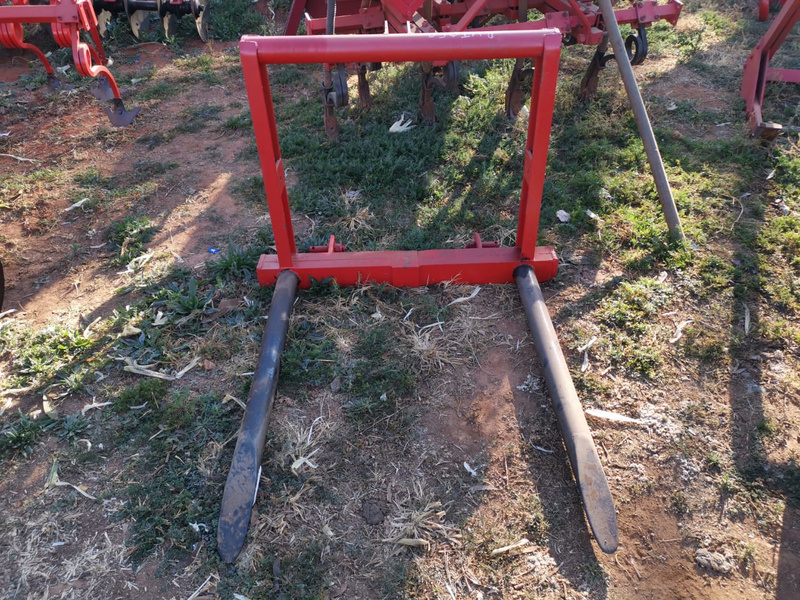 A jockey wheel and arm that pushes out as soon as the bale is loaded onto the fork prevents the loader from tipping over. Once the bale is loaded onto the loader a conveyor belt moves the bale to the back of the loader to make room for the next bale. The loader can load 4 bales with ease. To off load the 4 bales the whole bed of the machine is tipped hydraulically and the conveyor belt then moves the bales to the back of the loader off loading them one at a time. The bales are handled softly to ensure that the wrapping does not tear. The Kanna Industries General Conveyor can be used to upload and download general farming items such as feed, lusern and wool bales. A tyre is mounted to the conveyor to ensure that our clients can easily move the conveyor to where it is needed. The height can be adjusted mechanically from 1.8m to 4.5m high. The driving mechanism can either be hydraulic or electric depending on what our client desires. Our grader is designed to make any surface level by using the ground that is graded. The grading depth can be adjusted. The Kanna Industries Hydraulic Wool Press is fully automated. The wool that is loaded into the machine gets pressed down into the storage unit by means of a plunger. Once the plunger reaches its maximum distance 4 spikes from two opposite sides of the machine is driven through the wool bag to ensure that the wool stays in place when the next amount of wool is loaded. Our Wool Press has a build-in electronic scale for you to ensure that each wool bale has the desired weight. The machine is also mounted on wheels in order to make handling easier and also to transport the Wool Press to the site of the wool.